The Geotherm crew of Brett Hobson and Billy Lusty continued their winning streak in the 12 foot skiffs, winning the Port Jackson Championship hosted by the Sydney Flying Squadron on Sydney Harbour late yesterday. “We almost won start to finish, except for a scare from Murray Press and Scott Lanham (Bigfoot Custom Trapeze Harnesses), who got ahead of use about 300 metres from the finish line, only to capsize during a gybe,” Hobson said of his rivals who righted themselves in time to take second place. “They were very fast downwind all day and sailed right past us on the final downwind,” Hobson said. 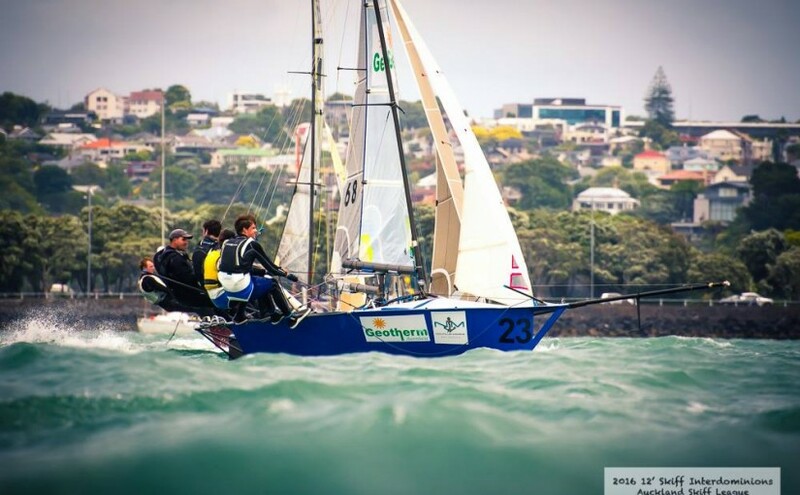 Having played bridesmaid to the Nick Press skippered Sydney Sailmakers on many occasions in the past, the crew of Geotherm won The NSW 12ft Skiff Championship in December and finished second at the 2016 Interdominion in January, the best placed Australian crew. Hobson, from Abbotsford, said 18 year-old Lusty from Berowra, who only joined him this season, has made a difference to the pair’s fortunes. In yesterday’s Championship, which started near Clark Island at 2.30pm, Geotherm got off the start line well in the pressured up north-easterly on a wavy Sydney Harbour. With a small lead at the first mark at Nielsen Park, Hobson lost a little time by the second mark at Shark Island, but recovered to extend up the second work to the Beashel Buoy, south-west of Sow and Pigs at Watsons Bay. On the run back to Clark Island, Bigfoot Custom Trapeze Harnesses gained a lot on Geotherm and was chomping at their transom just a few seconds behind. But Hobson and Lusty held their nerves, knowing they were strong upwind. “We again got away on the final work, but Murray (the father of Nick Press) again caught us on the run to the finish, and was set to cross us the line in front of us to win, but then had the swim,” Hobson recounted. Nick Press (Sydney Sailmakers) sailed consistently in third place all day to finish that way. The six-time Interdominion sailor was minus his latest crew, Andrew Hay, who was replaced by Damien Vlotman, a past 12 foot crew for Michael Spies. “It was a nice day. We all had our third rigs on – probably a little underpowered in the 15-18 knot breeze, but it was still fun. We did a long Harbour course. It included a change to the normal course, which was being tried out for the upcoming Australian Championship over Easter,” Hobson ended. This entry was posted in News, Race Reports on March 7, 2016 by Skiff-Ed.